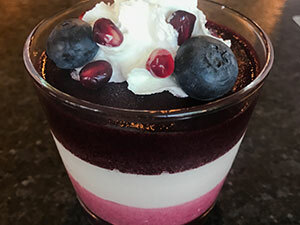 Not only is this patriotic dessert dressed in the July Fourth colors of red, white and blue, but it also makes a refreshing way to end a summer meal. Chef Lancaster prepares each sorbet flavor separately with fruit puree, sugar, inverted sugar, glucose and water. Once frozen, he spins each sorbet through a device that micro purees it, then layers the mixtures in dessert glasses, refreezing after each layer. If pressed for time, commercially prepared sorbets can be substituted. 1. Puree pomegranate sorbet and layer into 12 dessert glasses; freeze until firm. Puree lychee sorbet and layer on top of pomegranate layer; refreeze until firm. Repeat pureeing, layering and refreezing with blueberry sorbet. 2. To serve, top each dessert with Chantilly cream; garnish with blueberries, pomegranate seeds and mint.